Before we get too smug here in IT, we have our own skeletons rattling ominously. As I have written previously, the present epidemic of viruses, worms, malware and cyber attacks stems entirely from the computer industry’s own failure to make the majority of computers secure, even though it is technically possible to do so. Furthermore there have been an embarrassing number of failures in large software projects which either grossly overrun time and budget estimates, under perform or are simply abandoned, suggesting that knowledge of enterprise architecture is about as rare as knowledge of economics. But there is nothing new in questionable practices in IT. It has emerged that the genocide carried out in World War II was co-ordinated by data machinery supplied by Dehomag, which is short for Deutsche Hollerith Maschinen Gesellschaft, a subsidiary of IBM. It seems that Thomas Watson was personally involved in this and when dealing with Nazis was outlawed in the US, he did what any multinational company would do and routed his orders via Switzerland. Every homosexual, gypsy and Jew murdered by the Nazis had a Hollerith punched card that sealed his or her fate. How ironic that Watson was known as “The Leader” within IBM. Things like that couldn’t happen in England, of course. 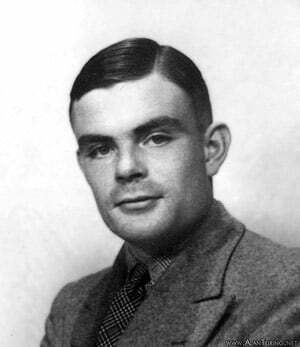 Alan Turing, the father of UK computing, and the one who shortened the war by cracking the German Enigma cipher so that German messages could be decoded, the one who devised the Turing test for artificial intelligence, was homosexual. He wasn’t murdered; he was simply harassed until he took his own life. On a more positive note, the sheer connectedness of society that is due to the proliferation of IT equipment does at least mean that it is not as easy today to keep people in the dark. And it’s easier to build models and run simulations to see if they work. At least in IT we know what a network is, and we understand that by having more than one connection to each location then a network becomes fault tolerant because if one link fails, traffic can be routed via another. Last winter, Network Rail discovered that its name was a bit of a joke when waves took out the railway line at Dawlish. Well, let’s just route the traffic elsewhere in the network. The slight difficulty, as is now well known, is that elsewhere didn’t exist. A single point of failure had resulted in Network Rail’s system being completely severed. Various inland lines that could have been put into service had been closed and taken up by people who were unable to assess risk. One of the most broken aspects of today’s society is energy. It’s a simple fact that we are consuming fossil energy a zillion times faster than it is created. It doesn’t require much brain to understand that this can’t go on. It’s not helped by the fact that our addiction to carbon pumps dollars into parts of the world that are politically unstable, if not ideologically opposed to western democracy. The sad thing is that some technological solutions do exist, but they are not being prioritised. That issue can be discussed at length. One can actually keep going like this, but after a while it becomes tedious. It’s all broken and held together with denial much like body filler desperately stuffed in a corroded car. The elephant is in the lounge, and like the rest of us, it’s eating too much fast food and getting more and more obese. Its mass helps to flatten down the stuff under the carpet. There is a tremendous opportunity here for change. Not change for it own sake, but change based on understanding problems and deciding on actions that may actually solve them. Actions that can be taken at all levels, from the individual upwards, that may improve our standard of living and reduce our anxieties and fears whilst not requiring our only planet to be pillaged as if there was another one round the corner.